Janaki Raman and Kalai Selvi were thrilled when she was pregnant for the second time. They were eagerly waiting for the arrival of the little bundle of joy along with their first daughter Deepa (6). They were shattered when the little was diagnosed with down syndrome. 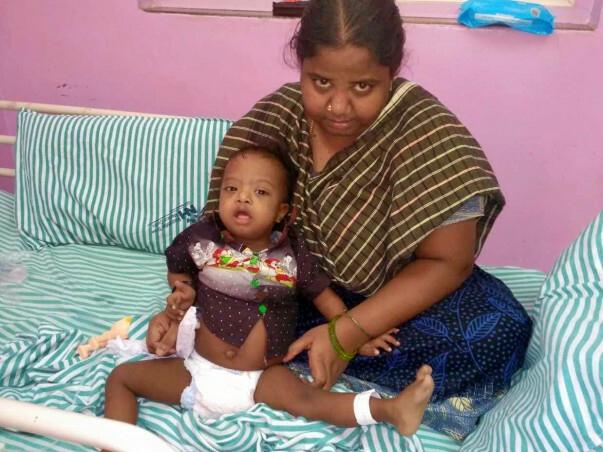 Even before they could completely understand its implications, Thirumalai Rajan who is now 1 year old is diagnosed with cancer. His family is completely shattered. Kalai Selvi's pregnancy was smooth until her 4th-month scan revealed that the baby has down syndrome. Janaki Raman and Kalai Selvi are from a village near Salem. Unfortunately, they were ignorant about the syndrome and did not understand what it really meant. Shockingly, the local hospital did not give them a clear information on down syndrome. They thought it is a fever and can be cured with medicines. No matter, what they decided to give the child the best. When Thiru turned one, he got a heavy fever and cold. He became too weak and was rushed to the hospital. A series of tests confirmed that he has cancer. Doctors said he needs to start the chemo cycles without any further delay. Janaki Raman took him to Bangalore hospital. Scan reports confirmed the same. Doctors said he needs intense chemo cycles for next 6 months. He may need a bone marrow transplant depending on his condition. It was a big blow to the family, they felt completely lost. Janaki Raman and Kalai Selvi have rented a room in Bangalore and have left their daughter in relative's place. Ever since the diagnosis, they became restless and have hardly slept and had food. 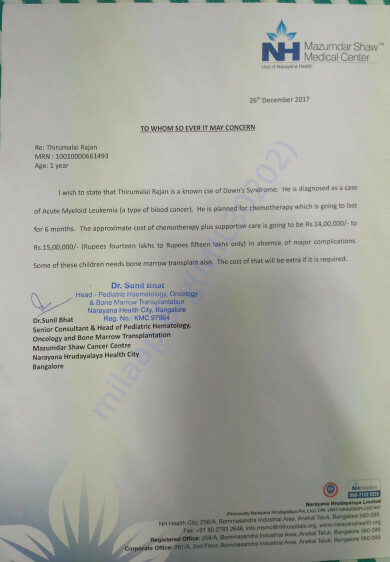 Now the most important concern of the family is to help him to recover from this dreadful disease.They are sure they can raise him as a happy child but money is a huge set back without which they cannot continue the treatment. Kalai Selvi is worried about her daughter Deepa also. This is the first time she stays away from her parents. She is missing her little brother and too young to understand the situation. She cries over phone everytime she speaks to them. Kalai Selvi feels helpless and is desperately hoping that she will soon see a light at the end of the tunnel. Little Thiru has completed two cycles of chemo. His little body could not bear the pain. He got severe fever twice and has been given medications for it. His chemo cycles will continue for 6 more months. Doctors are hopeful that he will show signs of improvement. Janaki Raman works as a weaver earning a very meager income. He is the sole breadwinner of the family. Now he is unable to work because of the treatment. He has to be next to his son till the treatment is over. He has already sold everything he had and borrowed heavily. He has spent nearly 4 lakhs he requires 15 lakhs for the treatment. This is beyond his means and he cannot earn that amount even if he works the whole year. Only your contributions can help Thiru recover from cancer.